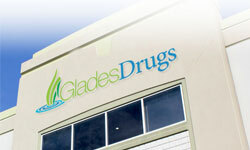 Glades Drugs is an independent pharmacy which strides to outperform chain pharmacy competitors. Founded in 1965 out of Pahokee, a small Florida town straddling Lake Okeechobee, we have remained an independent pharmacy owned and operated by pharmacists since inception. Unlike a large publicly traded chain pharmacy, our pharmacists have over 50 years of experience in the small towns we serve, and we hold ourselves to a higher standard of quality of service and customer satisfaction. We continue to service multiple generations of the families that live near our stores. Our practice is growing to include DME and other product lines and we plan to establish chains in multiple states. By bringing our small town family driven practices into a national market place we feel we can out service any of our competitors. Satisfaction is our core competency. 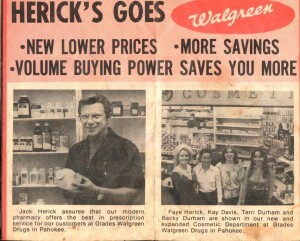 We are proud to continue the tradition of low prices, more savings, and excellent service since our pharmacy was founded in 1965. Over the years Glades Drugs has gone through changes such as becoming a Walgreen Drugs for several years before our founders decided their practices didn’t meet our customers’ expectations. Our family is striving to provide the same level of service our local customers have come to enjoy to our growing national customer base. We look forward to you joining our family and helping us celebrate 50 years of excellent service! Give us a call and you can speak to our owners. Our ownership consists of licensed pharmacists who actually work in our stores and service both our retail (local) customers and our national mail order customers. We practice what we preach, and we are able to transplant that small town feel from our community, to yours. Our pharmacists are standing by to provide advice, speak to your physician, and service any other questions or needs you may have.